Claudia Boschi has developed Aurum Vitae, a guided transformation as a path for those who want to feel life flowing inside the self and reawaken the magic of the Alchemist. It is the end of an outside search and the beginning of the power of transformation towards the Gold in life. Aurum Vitae is a deep transformation guided by Claudia Boschi. It’s the needed Light for the path to the inner Gold. Through the sessions (in the consultation or at distance), seminars, workshops and courses the person is lead to connect to its own Life path. During the process the person receives more support with the Cellulat Detox and the emotional releases to reach a physical and spiritual healing. Claudia has developed Aurum Vitae applying all her knowledge accumulated in the course of life: life coaching, naturopathy, reiki, homeopathy, nutrition, treatment of neuralgic points, ayurveda and other energetic methods assimilated over the years living in Japan, Germany and Spain. 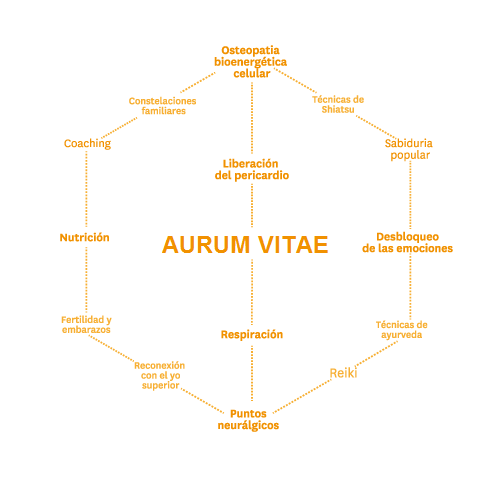 Aurum Vitae is the help to get back to enjoying life with the energy and the necessary tools to overcome the stones in the middle of the path, or use them to your advantage. Liberation of the Pericardium (Cellular Bioenergetic Osteopathy) is the result of the investigation of Montserrat Gascón (www.vivalavida.org). The Pericardium, membrane that protects the heart, is directly related with the impact the emotions have on our global health. The heart is the vital organ, the receiver and catalyst for emotional and spiritual life. Against fear or any threatening situation, it’s the pericardium that reacts by retreating itself. Liberate it means to release trapped emotions harmful for our health. Claudia Boschi has completed the preparation as a Trainer with Montserrat Gascón in 2009 and is recognized in Spain in this discipline; she has participated as exhibitor and lecturer in the most important trade fairs of the sector as Biocultura and Magic International, where thousands of visitors have proofed the benefits of this practice. Claudia offers the liberation of the pericardium in the consultation in the center of Barcelona and organizes regular courses to teach the Liberation of the Pericardium. We accompany people in their personal process to balance and develop their gifts and allow the soul to recover its mission in life, being in a healthy body. To achieve lasting results, effective wellness, it is easily understandable that action in a single plan is not enough.